A Pound Cake that is so rich and decadent no one will believe it’s vegan. Topped with a lemony glaze for a delightful sweet morning or midday snack. And that means I’ve got just 2 more recipes before the end of the year. After that, it’s time for some 30-day cleansing. So before that happens, I have to sneak in at least one more decadent recipe this holiday season. And decadence is just what I’ve got for you. This Vegan Pound Cake is a remake of one of my first recipe for the blog. The original recipe was an Orange Poppy Seed Pound Cake. I have since re-tested and updated the recipe to make it easier, tastier, richer, and overall better. If you came here looking for the Orange Poppy Seed Poundcake, you can still access it here. But I think you’re going to love this new and improved vegan pound cake recipe. I omitted the commercial egg replacers, switched oils, adjusted the leavening agents, and pumped up the flavor so that you get a rich, vibrantly lemon, buttery, decadent vegan pound cake that makes the perfect dessert or snack at the last of your upcoming holiday parties. What is a pound cake? Traditionally pound cake is made from combining equal parts butter, flour, sugar, and eggs. Over time the ingredients in a pound cake have gotten more complex. 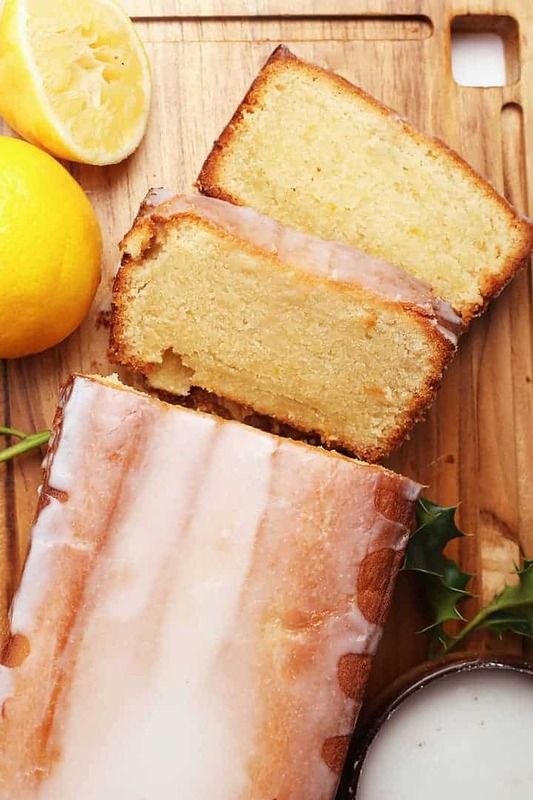 It is now common to add extracts (such as lemon or vanilla) and/or fruit, swap out some of the butter for sour cream, and even add a few teaspoons of baking powder to make the cake lighter and less dense. My modern take on a pound cake has made many of these adjustments. First, we need to find the perfect egg replacer. Since traditional pound cake is made with a pound of eggs, we need to find the best egg replacer for this recipe. Eggs typically work both as a binder and a leavener in pound cake and originally my vegan pound cake relied on commercial egg replacers which I now prefer NOT to use because they a) can be hard to find and b) are made with all kinds of unpronounceable ingredients, and c) can be vastly different from each other, reacting to a recipe differently and leading to too much variation in the end result. Now my egg replacer of choice for vegan pound cake is a combination of sour cream and baking powder. Together these ingredients work as a binder and leavener, keeping the cake moist and light. Second, we mix together the ingredients. In one bowl, mix together the dry ingredients. That’s the flour, salt, and baking powder. 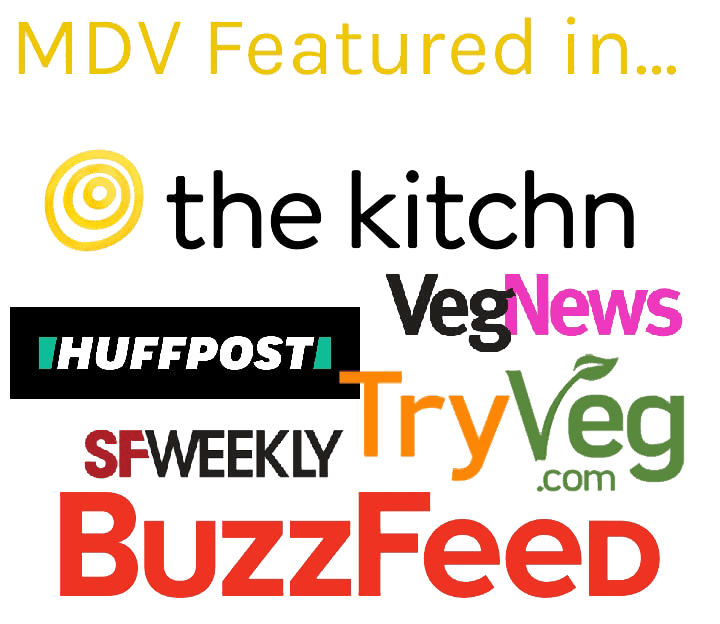 Next, the vegan butter, sugar, and lemon zest get beat in a stand-up mixer. Once the butter and sugar are beat, we slowly add the sour cream. At this point, the batter might curdle a bit and that’s okay. It will come back together when the flour is added. Next, we are going to finish the cake by alternating the dry and wet ingredients into the batter. Why alternate wet and dry ingredients? Good question! By alternating we are making sure the batter stays as tender as possible. By adding all the liquid ingredients first, the butter would start to separate from everything. Yet, adding all the dry ingredients first would cause the batter to get thick and require over-mixing in order for it so even out. 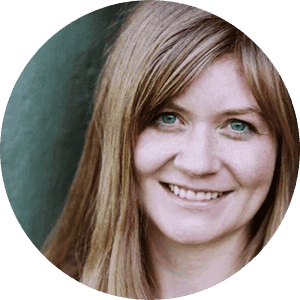 And, as we know, over-mixing results in a gummy glutenous texture – not what we’re looking for in a pound cake. So with a lightly mixed batter, we can pour it into a prepared loaf pan and bake! Don’t over-mix the batter. By alternating the dries and wets into the batter, we are ensuring the batter does not get over-mixed and gummy. Generously spray your loaf pan. We do not want any of this delicious cake sticking to its edges. Bake until a toothpick inserted in the middle comes out clean. If the cake starts to get dark around the edges, you can cover it with tin foil to bake the last 10 minutes. Let the cake cool at least 30 minutes in the loaf pan before turning it onto a wire cooling rack to cool completely. Let the pound cake cool completely before pouring on the glaze. Otherwise, the glaze will melt off. Pound cake can be stored, tightly wrapped, at room temperature. You can also freeze this pound cake for up to 2 months. Take it out the day before to let it thaw. Can this vegan pound cake be made in advance? Yes! 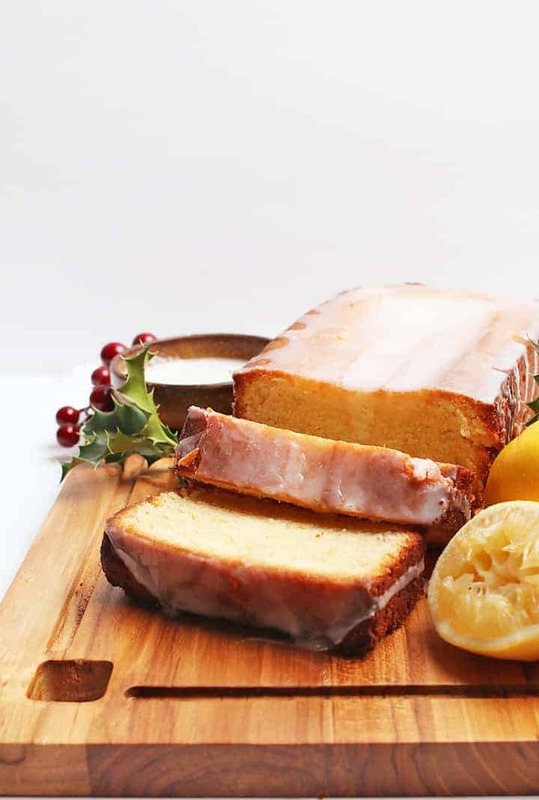 This Lemon Pound Cake makes the perfect holiday gifts and can be made in advance. To do this, bake the pound cake according to the instructions. Once the pound cake is cool, wrap it tightly in plastic wrap and place it in the freezer. These pound cakes can be frozen for up to 2 months. 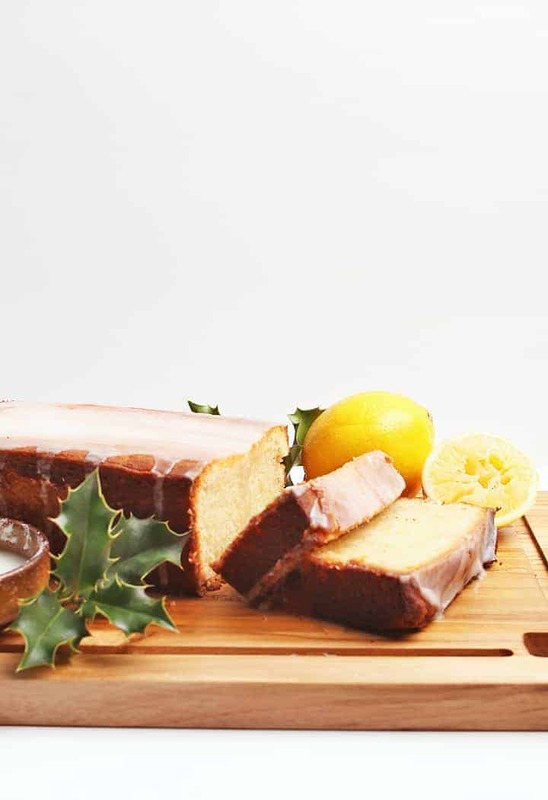 When ready to gift or serve, let the pound cake thaw at room temperature for 3-4 hours. A vegan Pound Cake that is so rich and decadent no one will believe it's vegan. Topped with a lemony glaze for a delightful sweet morning or midday snack. Preheat the oven to 350 degrees F. Spray 1 loaf pan and set aside. In a medium bowl mix together flour, baking powder, and salt. Set aside. In a separate bowl, combine coconut oil and lemon juice. Set aside. In a stand-up mixer or an electric handheld mixer, beat together the butter, sugar, and lemon zest until light and fluffy. With the motor running, add vegan sour cream, scraping down the sides as necessary. The mixture will appear to have separated at this point, but it will come back together. 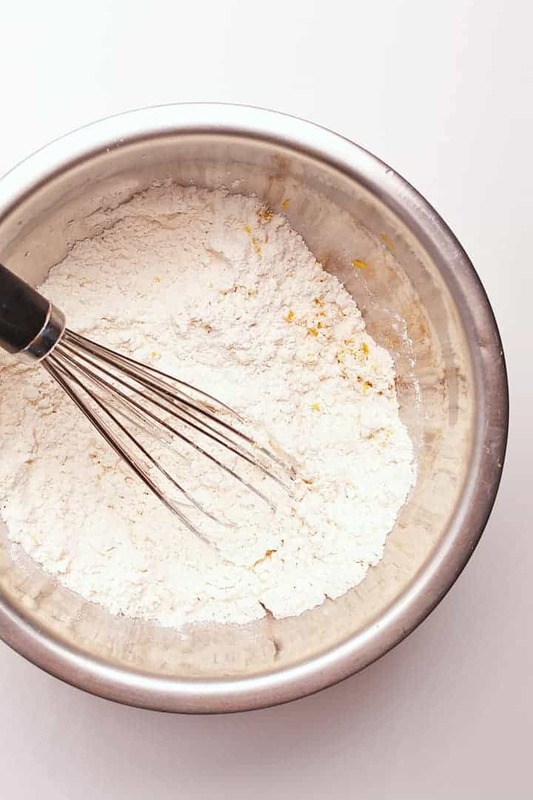 Alternating wets (oil and lemon juice) and dries (flour mixture) add in three batches, scraping down the sides as needed, ending with the flour mixture until it just comes together. Do not over-mix. Pour batter into prepared loaf pan and smooth top. Bake until cake is golden brown (about 50-55 minutes), and a toothpick comes out clean when inserted in the middle. Remove from oven and let cool for 30 minutes. Flip out onto wire racks and allow the loaf to cool completely. To make the lemon glaze, combine powdered sugar and lemon juice until smooth and pourable. Pour over the cooled loaf pan. The glaze will harden as it cools. Keep at room temperature, tightly wrapped, for up to 3 days. 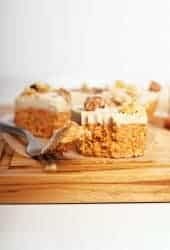 This cake can also be stored in the freezer for up to 6 weeks. Bake until a toothpick inserted in the middle comes out clean. If the cake starts to get dark around the edges, you can cover it in tin foil to bake the last 10 minutes. Should I use a 9×5 or 10×5 loaf pan? Will it matter? can gluten free flour be substituted? thank you! Hello, Can i put this in a bundt pan? Yes, that would work although I would make about 1.5x the recipe to fill up the bundt pan. Just a note to ask how much vegan butter is needed if calculating it in the metric system, since the recipe says 2 vegan butter ? Thanks for clearing that so I can try this deliciously looking cake. I suppose it is 200 or 250 gr. I’m not sure why it was converting that way but it should be 125g. I have adjusted the recipe. Can i replace oil for vegan butter? Unfortunately not without altering the rest of the recipe. Otherwise the batter will be too loose and not bake correctly. Made this as one of the 3 vegan desert options for Christmas! Came out beautifully! When I tried the glaze alone I thought it was too lemon-y but once it was added to the cake it went so well together! The cake came out very dense, is there any way to make it more soft and fluffy? Would I need to add more of the vegan sour cream? I definitely plan to make this again, it was also very easy to make. Thank you! I made this pound cake yesterday and it was divine. Even my omni boyfriend could not get enough of it. We are now making two more to take to take with us on Christmas. I did not have vegan sour cream on hand so I made some out of cashews. My dough came out quite thick so I added a little soy milk but the cake still came out amazing. Thank you for sharing! I’m so glad you liked it, Chrystal! I use to be obsessed with this lemon pound cake from starbucks. This immediately made me think of that pound cake. Gosh, I cant wait to make this recipe haha thank you! I think you’ll find it tastes very similar! 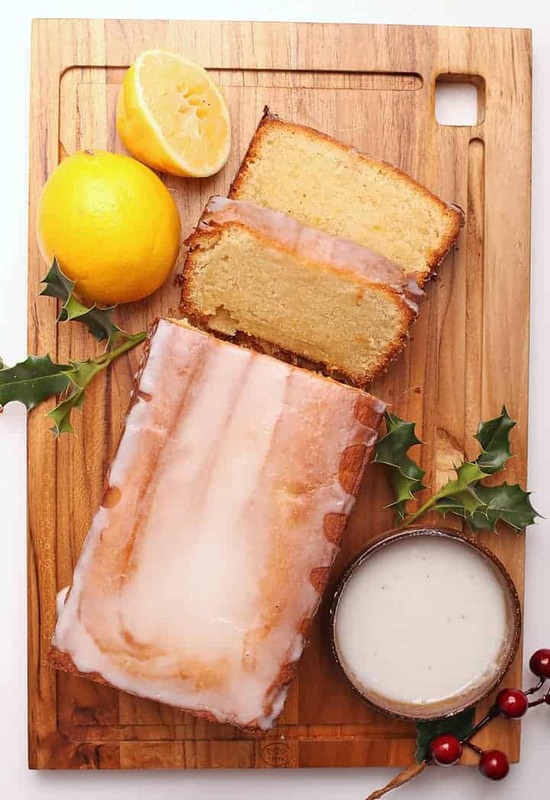 Love the recipe of the lemon cake but here in the UK I’ve never seen vegan sour cream. Ordinary cream yes but I’ve noticed you have a wider range of vegan foods than here. We’re getting there slow but sure though. Love your cake but I’ve never seen vegan sour cre.. You seem to have a bigger variety of vegan products in the US than we do I’ve noticed with a lot of ingredients. If you want to give it a try you can try making your own sour cream recipe. here’s one that I would recommend. Hi – this looks amazing – just not sure whether I can get vegan sour cream in the shop here in the UK – do you have a recipe for it so I can make it myself? Thanks! I don’t have a recipe personally, but here’s one that I would recommend. I’d like to make these with lemon…mmm. Is orange/lemon extract necessary for this recipe, or do you think some extra zest could do the trick? Lemon zest should work. Lemon is stronger than orange anyway, so I would probably just make it that way. 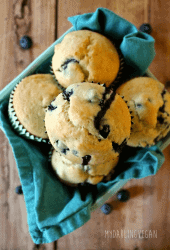 Have you tried using this recipe to make muffins? I’m wondering what the baking temp and time would be and if they would turn out the same? I’m wanting to bring this to a brunch and thought muffins might work better this time. I haven’t tried it, but I imagine they would be delicious! You could keep the same baking temp and check them after about 20 minutes (they will probably take more like 28-32 or so) but check by inserting a toothpick into the center. Good luck! This looks amazing, and I’m hoping to make it this week. I just have one question – do you think this would freeze? It’s just me, and I don’t know if I could finish it before it went bad. Thanks! Yes it would freeze just fine. I made this and froze it for a month to serve it at Christmas and it was tasty as ever. This was the fist vegan baking I have done and it turned out perfectly. 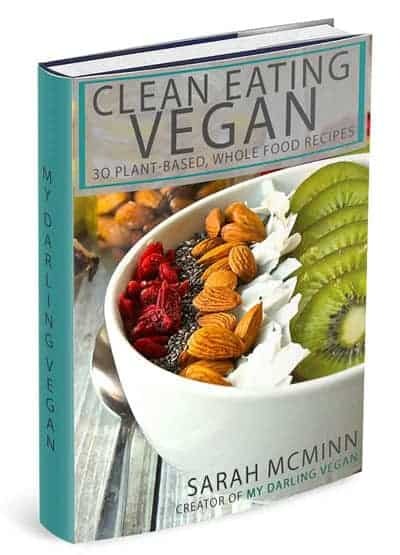 Everyone loved it – including the non-vegans in the family (and my dog who stole a loaf). This recipe inspired me bc I realized that vegan baking can be as delicious as anything with animal products. I have to say that all of these recipes rival anything with eggs or other animal products in delicious-looking-ness. 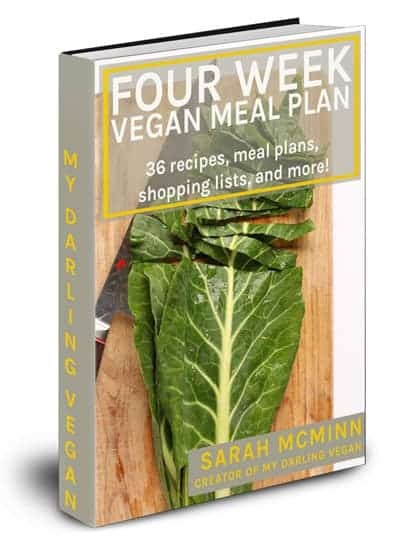 I don’t eat red meat or pork – and getting my feet wet with vegan baking is a good way to eliminate even more. Ever since I made cupcakes using pumpkin to replace some of the ingredients, I was amazed at the moistness and richness. 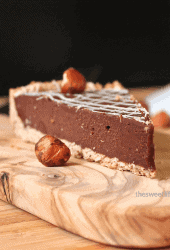 Yes, vegan baking can be amazing! You probably saw it, but if not here’s my post about replacing eggs: http://www.thesweetlifeonline.com/2012/11/29/replacing-eggs/ for all kinds of baking. It may help you along the way. Good Luck! Luscious! Yep, sometimes you’ve just got to indulge.